Sunday afternoon I was having a hilarious phone conversation with a good friend. One of the ties that binds us is the — shall we say, large — role alcohol played in our households as children. We were exchanging the inevitable tales of holiday hijinks. He told me about the Christmas his grandfather smashed a chair over his uncle’s head. And in turn, his uncle broke a raw egg on his grandfather’s forehead. You know, the usual reindeer games. I told him about the year my mom finished decorating the Christmas tree, helped along by her regulation bourbon and water. After all the lights, ornaments and tinsel were done, she remembered she’d wanted to spray fake snow on the tree. So, she did. Thus giving us a collection of ornaments and lights covered with slightly un-festive white chunks for the next several years. Now, only one ornament from this collection remains. I told my friend how I always save this one for last when I decorate the tree. It makes me smile to look at it. It’s one of those big red vintage glass kind, with “Merry Christmas” in cursive, a few flecks of mom’s snow still on it. We were laughing and inventing my mom’s slurred dialogue as she decorated the tree when I heard the sound of glass breaking in the living room. I ran in, expecting to see my husband up to something clumsy. He was sitting innocently in his chair. 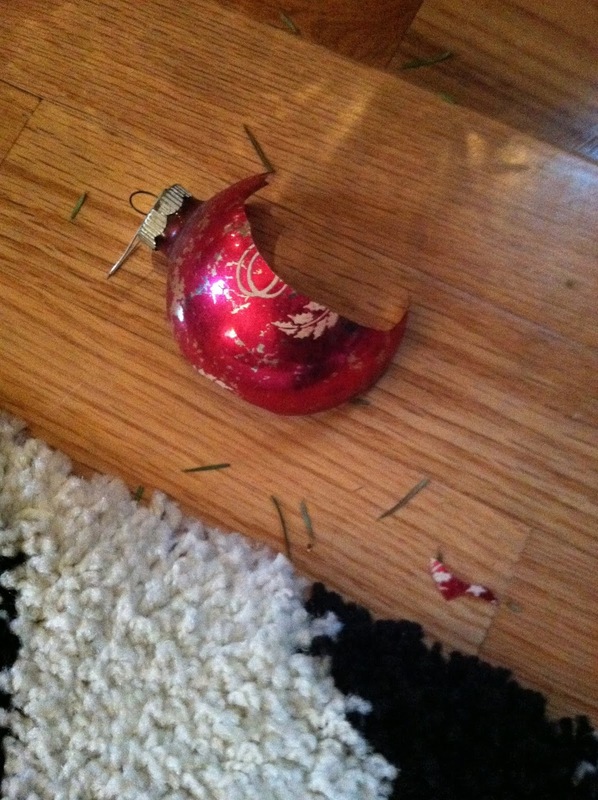 The very ornament we’d been discussing, that red one, had fallen off the tree and crashed to the floor and shattered. THAT VERY ORNAMENT. When I told this story to other friends who knew her, we all agreed: this was Betty, 100%. Especially in the way I first blamed it on my husband. She’d have liked that. Merry Christmas, Mom. And I am trying to be good. It’s just so hard sometimes. Poor Cuddy–can't catch a break. I loved this story. My m-i-l's (name: Betty) handmade eggshell ornament sits front and center on our tree. She was a teetotaler so I'm not expecting any action. I love this story. Thanks Kitty. When I was a kid we didn't have a Christmas tree and my parents didn't drink. This sounds like fun.